A dynamo since she first joined her family’s traveling song and dance troupe as a child, Shari Burdt has been leading children to literacy in her hometown of Flint, Michigan, for more than 40 years. And when her job as an instructional materials clerk for the Flint Community Schools was outsourced a few years ago, she found an alternative route — AmeriCorps — to keep doing what she loves best. David Bush, community school director at Flint’s Doyle/Ryder Elementary School, is working with Burdt to roll out an afterschool “boot camp” for struggling readers. “I could have continued to work for the district as a secretary, but I didn’t want a desk between me and the kids,” Burdt said of her decision to join AmeriCorps four years ago. 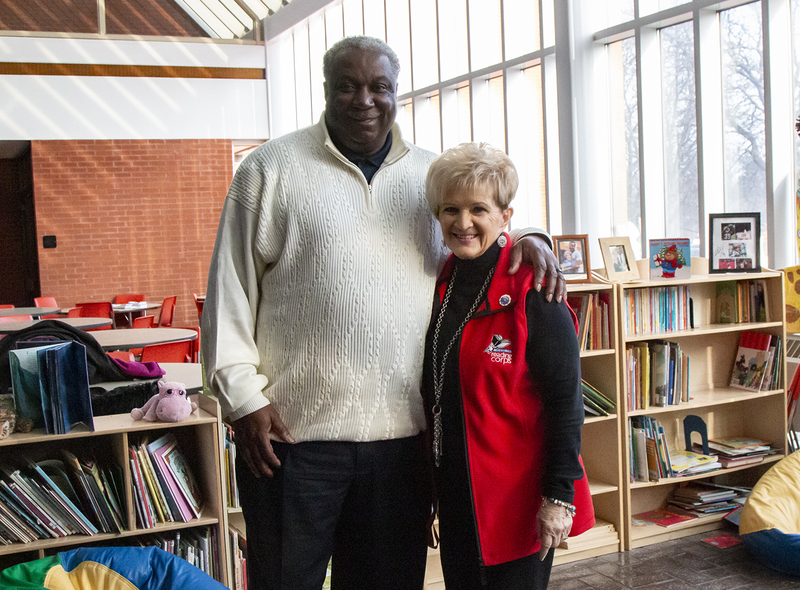 At 76, she is the oldest of the more than 200 AmeriCorps members now serving in Flint. She brings years of teaching experience with her, as well as a deep understanding of how children learn. Beloved by students and staff, Burdt has developed a way of making reading exciting and fun — working one-on-one with struggling readers to reduce their fear, frustration and embarrassment. Her greatest success so far, she says, was helping a student who could identify only five letters work his way up to reading 127 words a minute by third grade. 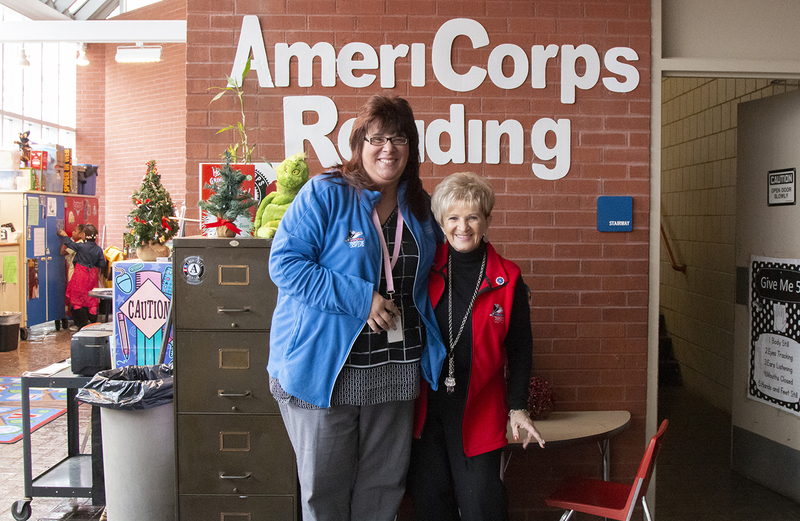 “I treat them as I would my own children,” says AmeriCorps Flint Reading Corps member Shari Burdt, who says she learns as much from the third-graders she tutors as they do from her. Joining AmeriCorps has helped Burdt expand her contacts and locate even more services that “her kids and families” at Doyle/Ryder might need and use, she said. Through the training and networking activities offered by the Flint National Service Accelerator, an initiative that has received more than $3.9 million from the Charles Stewart Mott Foundation, she has been able to connect with members serving through the FoodCorps, the Flint Community School Corps and the National Civilian Community Corps (NCCC). It has “opened my eyes to opportunities I didn’t even know existed,” she said of meeting AmeriCorps members serving nonprofits throughout the city. 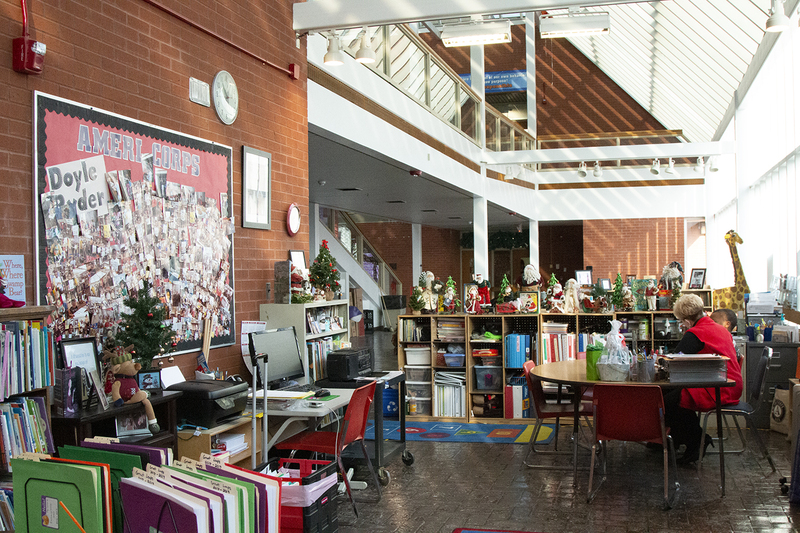 Burdt’s cheerful “reading corner” is a favorite destination for Doyle/Ryder students. That enthusiasm carries over to her work at Doyle/Ryder, where in addition to running the AmeriCorps Reading Center, she now is offering an afterschool “boot camp” for struggling readers. Supported by a Mott Foundation innovation grant awarded through the Crim Fitness Foundation, she and Bush recently kicked off the “super intense” program, which targets readers who are not served through other literacy interventions at the school. Fellow AmeriCorps member Melissa Wirt works side by side with Burdt to strengthen the reading skills — and confidence — of struggling students. “Oh, they love the treasure chest,” she said. “They even tell me what they want in there.” While the small treats and toys are great incentives, they aren’t the only thing Burdt collects for students. She also has a drawer filled with new socks, underwear and snacks (which she solicits as donations or purchases out of her own pocket) for children who might need them. To that end, Burdt also runs a dance class, a singing ensemble and an afterschool theater program at Doyle/Ryder — all developed to help students gain confidence and discover their talents. She joined them for the school’s holiday program, tap dancing in the role of Mrs. Santa Claus. “Age doesn’t matter” Burdt said. “It’s what you do with what you’ve got. I would love to have more older people join in. There’s so much to gain through AmeriCorps, if you are open to it.